In many areas of Phi Phi life on the Islands has got back to normal thanks to the many Phi Phi Tsunami charities and individual donors that stepped forward to help assist the people of the area get back their lives. They have provided support and funding to bring restoration to a tiny place so totally devastated in the area down by the Phi Phi island pier and on the Loh Dalum beach front. Many lives were lost during the Phi Phi Tsunami, and those can never be forgotten or replaced, but thanks to the help of many Phi Phi Tsunami charities, Phi Phi Island has been rebuilt in stages to its former beauty and grace. 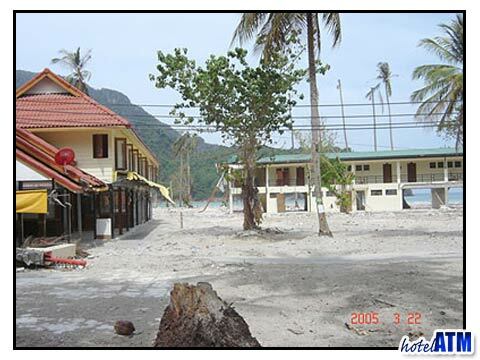 Images from after the tsunami. The illogical nature of luck spared a life here, but took one, maimed one, orphaned another there in a fury of natural violence that geologist say only happen in this region every 175 years. The knowledge of the frequency of the tsunami here on Phi Phi gives little consolation but provides hope for the future, hope that essential ingredient on which the many have started to relive their lives. The living and rebuilding in no small part has been down to exposure the world media gave this catastrophe and the following out pouring of feeling for all those caught up in the tsunami and aftermath. Phi Phi Island was also helped by being exceptionally popular, well photographed and appearing as the key location for the film "The Beach" starring Leonardo Di Caprio. The charities come in 3 broad categories. The first style of charity is the international charity that focuses on collecting money from the wealthy donor nations and gets this funding to the key organizations, government institutions on the ground. The second style has a more hands on approach. These are the specific charities set up by people on the islands who helped organizing the rebuilding of homes, re housing for those who lost everything, helping to give a life to the orphaned, re building businesses, the environment and much much more. Hi Phi Phi and The Phi Phi Island Dive Camp were sensationally successful example of these. The third category was based on individuals in clubs like Rotary, Lions football clubs, brownies and more who instinctively gave their thoughts and time to collect for this disaster. They often tried to get their contributions to the source of the problems bypassing the large aid organizations with their saddeningly large overhead structures. At phi-phi.com we were often asked to help to get contributions or convert contributions into what was actually needed to the school and orphanages in particular. The list below is far far from complete but gives an idea of the types and style of Tsunami Charities that helped Phi Phi during the December 2004 and 2005. Phi Phi Aid is based in the United Kingdom and is one Phi Phi tsunami charity that has offered much in the way of financial assistance and project support to the people of Phi Phi Island. They have worked with Thai nationals and other international charities to helps reopen business establishments and the school that now houses over 40 children. The Family Care Foundation (FCF) has also offered a great deal of support to the rebuilding of the Phi Phi Islands. This Phi Phi Island charity responded immediately with help in rebuilding the island, as well as evaluating the needs of those who lost everything on the island. They staffed a daycare center for tsunami orphans and the children of Phi Phi Island's tsunami survivors. To try to get back to a sense of normalcy. To create an learning environment to promote these children. To create a library that would be child-friendly to help enrich their educational opportunities, but would that it would also shine a light on the positive possibilities of life away from the harsh realities of their experience. All donations made to this Phi Phi Island charity go directly to tsunami relief efforts. Another Phi Phi charity that benefits all of the victims of the tsunami is The 4Kali.org Foundation. It was created in honor of Kali Glynn Breisch and thousands of others from 28 countries who lost their lives in the tsunami, not only on the Phi Phi Islands, but in other places in Southeast Asia. This Foundation is dedicated to helping the Phi Phi Islands and other affected communities rebuild their lives by funding and starting projects that will make a positive difference in the lives of those affected. The Breischi parents were on a live aboard in Khao Lak on 26th December 2004. They returned to Khao Lak to find their son but not their daughter Kali. 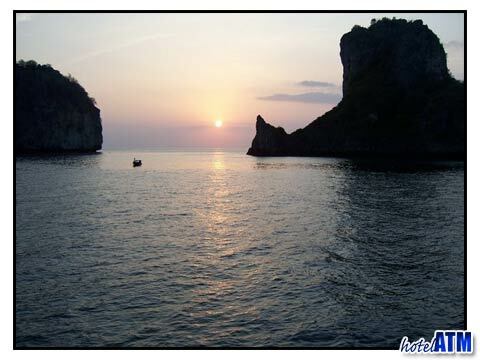 Hi Phi Phi is a true, Phi Phi Island charity fundamentally run from Phi Phi Island itself. This initiative is community-based for local residents of Koh Phi Phi and non-Thais. This group has joined forces to help the people of Phi Phi recover from the terrible aftermath of the Tsunami. Hi Phi Phi tsunami charity has the honor of being listed in the 2005 Time Asia's Hero's edition. Andrew Hewitt, along time resident of Phi Phi Island and instigator or a myriad of wonderful tours of the island both on land and at sea started up the Phi Phi Island Dive Camp whose aim was to clean the main bay of debris from the Tsunami. He did this by taking a continual stream of volunteer snorkelers and divers down to clear up the reefs and sandy bottoms to ensure the ecology of sea beds around Phi Phi island was not marred in away that would stop the regeneration of the Phi Phi diving a line of work so crucial for the island and to stopping any long term pollution risks.